P.O.L. Cream is formulated to deliver the proven benefits of Phospholipids -powerful natural antioxidants and the chief moisturizing agent in the skin which penetrate the skin to provide long acting moisturizing and protection – to provide symptomatic relief of the discomfort , i.e. itching, redness and flaking associated with very dry skin, psoriasis, eczema, ichthyosis and dermatitis. Phospholipids are the prime building blocks of all life forms – and thus Phospholipids are indispensable to all forms of life and healthy skin: assembling and strengthening skin cell membranes, stimulating microcirculation and accelerating the natural healing of superficial and serious traumatized skin. P.O.L. Cream is effective at relieving the discomfort often caused by the extreme dryness associated with psoriasis, eczema, ichthyosis and dermatitis. The super-moisturizing formula of P.O.L. CREAM is highly effective to hydrate and rejuvenate skin to keep it healthy. Scratching just makes it worse. P.O.L. Cream is steroid-free and antihistamine-free, so you can use it as often as needed. Can be used without a prescription or a doctor’s order. Non-greasy formula will not stain clothing or bedding. Limit bathing. Daily bathing isn’t necessary. Spongebathe the areas of the body that need it most. When you do bathe in the tub make it quick. For those who prefer to shower use Cabot Oat Protein Body Wash, also helps reduce irritation and razor burn use when you shave. Cabot Oat Protein Body Wash and Cabot Oat Protein Cleansing Bar are both mild cleansers. The oat protein they contain is a skin soothing plus. Bathe or shower in warm water. Hot water can over dry the skin. Choose products that are fragrance-free. Fragrances can trigger eczema flare-ups. 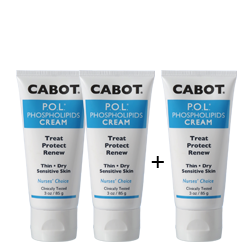 To help skin hold moisture, apply Cabot P.O.L. Cream right after bathing while skin is still damp. Get in the habit of moisturizing the entire body and not just the parts of the body that are affected with eczema. Cool compresses can soothe itchy areas.